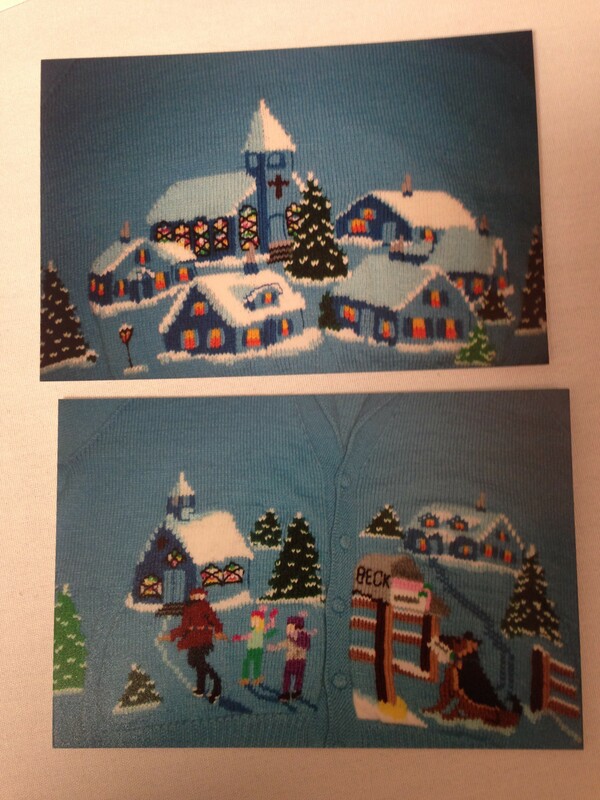 Ruby Townsend was in the “Intarsia with a Twist” class at Stitches West, to learn how to do intarsia in the round. I like to wander around before class and see what yarn people brought to work with, because it is fun to see what types of yarn knitters bring. Ruby apologized, because I ask them to bring 100% wool for class, and she brought acrylic yarn. The reason I ask for wool is that it is easier to work with, but I assured her that the acrylic was fine, and it wouldn’t be a problem. Ruby said that she always knit with acrylic yarn. Still as beautiful as ever, and yes, she knit that sweater. With acrylic yarn. Still learning new things and exploring possibilities. Go, Ruby! 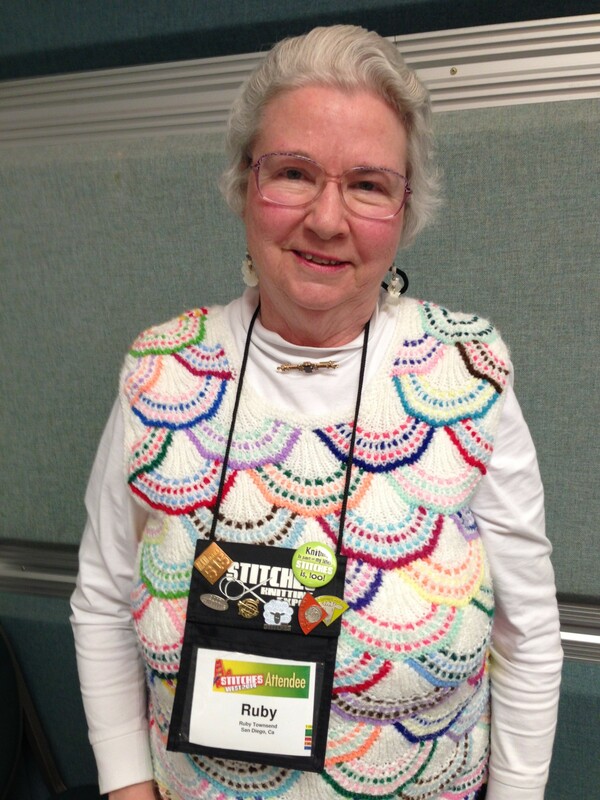 When class started, I asked if anyone had knit intarsia before, and Ruby raised her hand. Later, as the class was practicing the technique, I walked around to see how everyone was doing. Ruby asked me if I would like to see some of her intarsia work. Of course, I did, so she pulled out a little book filled with photos. Here is what she showed me. Ruby designed and knit this custom blue cardigan for Glenn Beck, knit entirely with acrylic yarn. Take a moment to contemplate the achievement. I’ll wait. I wanted to see more of the book, so I asked her to share with me, as class ended. It turns out that Ruby has quite a story. This particular sweater was custom designed and knit for Glenn Beck. 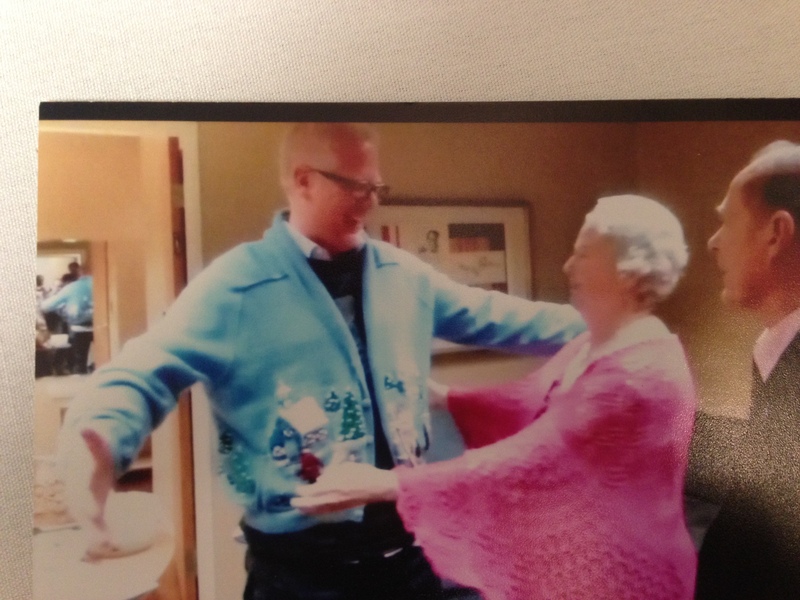 Glenn about to give Betty a big hug, wearing his custom-knit sweater. And look at Betty’s shawl! Ruby also did quite a lot of knitting for Johnny Cash, June Carter, and their family. 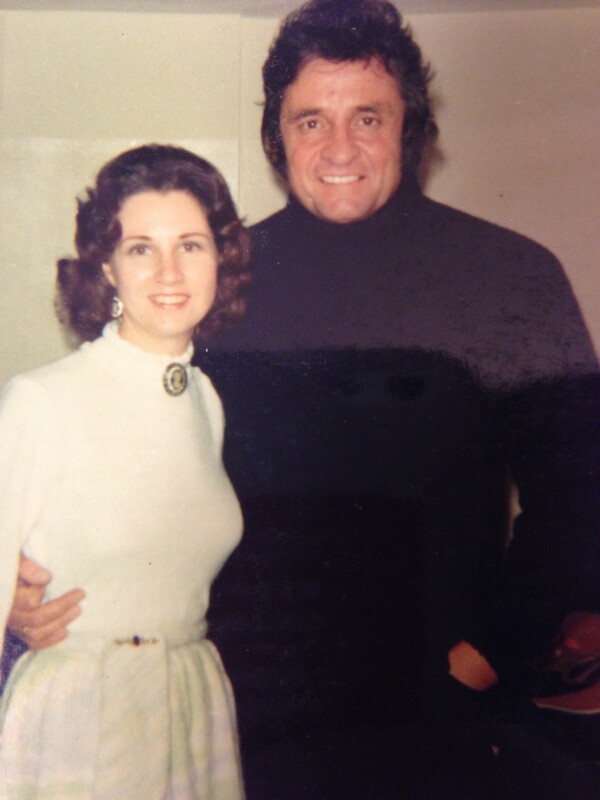 A black vest she knit for Johnny Cash is in the Country Music Hall of Fame, as one of his favorite pieces of clothing. 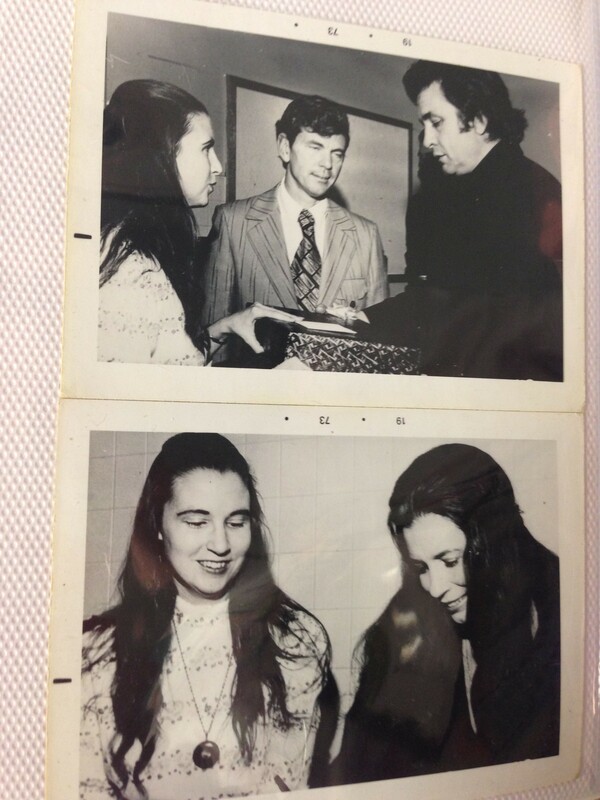 I really enjoyed the photos of young Ruby, with the recipients of her beautiful work. I must say that Ruby is also incredibly lovely today, and I hope that when I grow up I have her verve and continue my passion for learning new things. As for acrylic yarn… it gets a bad rap. As Ruby shows, it can create beautiful garments. And, it won’t deteriorate as natural fibers do, so if your item is destined for a museum….just sayin.